** For easier access save these under “Quick Texts” or equivalent in your radio. *** GPS/GNSS and Telemetry data will also be forwarded on to aprs.fi. How do I send a web message to a CidComm DMR Radio via the web? To send a DMR text message simply type in the users DMR ID and message you would like to send. Include who you are in the message so the recipient knows. How do I send a short message to a CidComm DMR Radio via email? 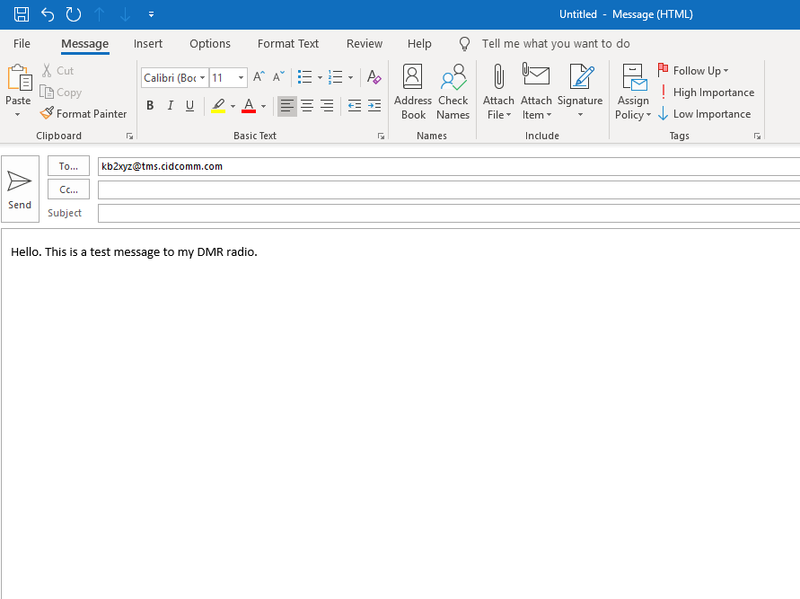 To send a DMR radio a short message simply send an email to the registered users callsign @tms.cidcomm.com and what ever message you would like as the email message. Subjects are omitted. The page will then get routed out all of our transmitters and MicroCells to the recipient. To register for a custom address you can use our contact page to request it.